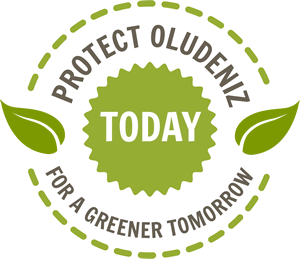 Protect Oludeniz today for a greener tomorrow. When we first opened Deniz Camp (todays Buzz and Ecclesia) everything was green. There were citrus orchards and a few subsistence farmers behind the camp, a shining beach and crystal clear waters. We drilled an artesian well, set up some tents and made a restaurant by covering a platform with reeds. Solar panels heated the water whose waste ran into tank which was was biodegradable. The seafront provided us with lobsters and octopus and from the lagoon area we caught red mullet and mussels! All dairy and meat produce was delivered by farmers in the valley. Seawater flavoured our spaghetti and the whole beach was our playground. Little did we realise the touristic potential. Alas far gone are those day..! With an international airport just 60 km away, ever larger complexes have been built in the valley and in the surrounding hills. While we mourn our peaceful past we rejoice that so many visitors return year after year to enjoy Oludeniz. Lets protect Oludeniz today for a greener tomorrow. At Buzz, Ecclesia and Mozaik we still buy from ethical local producers whose poultry are allowed to roam their pasturelands rather than supporting the large commercial dairy and meat complexes. For several years we have been filtering our water to use on the lawns and recycling our hotel and restaurant waste... but have never reached our target during the summer rush. This year we also have a member of staff whose one job is to sort and separate all our waste materials. Apart from an area dedicated to glass, plastic aluminium and paper there will be collection points for excess food, bread and grass cuttings. Used cooking oils are collected and sent to a bio-energy complex. Take-aways will be in biodegradable containers. We are asking our providers to use minimal packaging. This is a very important factor which we hope to encourage all touristic complexes to aim for. As we all now realise the sea is becoming ever more polluted with plastic, we have ourselves cut the use of plastic to a minimum... sorry! There will be no more plastic straws! While on site all water will come in glass bottles. We are happy that you have read this and await your suggestions and comments.